This project started as a 2008 Special Edition Yamaha Rhino. Over the last three years I have been abusing this rhino on the trails and trying out numerous products trying to make it a more capable and enjoyable trail machine. This page is full of links to reviews I have written on items that are directly rhino related as well as a few items that are universal and can be mounted on any ATV/SxS (such as wheels and tires). This project is not done yet and as I feel most of you will agree a good project is never done! Be sure to check out Operation X for the final chapter to this build! This kit from Seizmik ships to you with everything needed to add some lighting to your bike and to your night riding, all you got to do is install/wire up everything and you are ready to go.. Read More. Looking for a change and to add a little bling to the rhino I went to DWT Racing and picked up a set of their Diablo Beadlocks with the black finish from their selection of litecast wheels. Read More.. This is an excellent little item from EMP, It is a well built rear bumper for the Yamaha rhino that not only bolts to the bed but also mounts to the pivot points of the bed and pivots with the bed. This setup is Laser cut and CNC formed in the USA (In Cleveland Ohio). Then it is welded, all welds are ground smooth, and then powder coated Texture black that provides a good match with the rest of the rhinos Powder coated parts. Read More. A couple months ago I installed a set of stock replacement HID's from SidexSide Customs which was such an improvement over stock it yielded my bumper mounted halogen lights useless. This got me to wondering just how a good set of larger HID's would do mounted to my Pro-Armor Baja style bumper. After doing some research I went to Baja Designs, one of the leading manufacturers and marketers of lights for the offroad industry and found they offer 6" PreRunner HID's with a lifetime warranty. Read more. Since day one I have felt the lighting on my Rhino good have been much better, After a month or so of riding I installed a set of 55 watt fog lights which helped a little but still was not enough. Until I installed these lights from SidexSide customs I didn't realize just how weak they was. These 35 watt HID's (6000k) are so much brighter than stock, now my 55 watt fog lights are nothing but bumper ornaments Read More. After a year and a half of riding I noticed my Rhino's undercarriage was getting pretty beat up due to bottoming out on large rocks, trees, and other trail obstacles. My front and rear stock plastic skids were busted and were not serving much of a purpose so I decided it was time for a good set of skid plates. Instead of just replacing the busted plastic skids I went to Ricochet and got a full set of armor for my Rhinos undercarriage Read More. If you have ever rode on a hot summer day or a rainy day with no roof, I am sure you are like myself and feel a good roof is a necessity for the Rhino. An aftermarket roof not only adds unique looks and styling to the Rhino, but It also adds protection Read more. When it comes to a stereo setup for the Rhino there is several options. The three main options are, the in dash option that removes the warning label in the center of the dash, the below dash housing, and the overhead compartments. 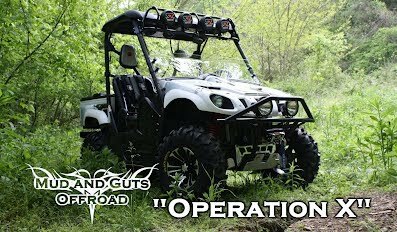 I chose this overhead compartment from QuadBoss because the mud and water we sometimes cross is too high for me to feel comfortable with the lower housings.Read More. ModQuad Billet Front frame support. ModQuad Billet Gas and Brake pedals. Pro Armor Soft Cargo Cover..
How often have you carried cargo? How often have you got to the camp site and found you camping equipment or other cargo covered with mud, dust, and other debris? This cargo cover from Pro Armor is an excellent item that is designed to protect your cargo when needed and is easily removed when not needed. Read more. This Safari Rack from Pro Armor is a product that allows you to store an abundance of your gear in front of you, where you can keep an eye on it. This rack is designed out of tubing which allows you to strap all your gear down with bungee cords or something similar making it easily accessible yet totally secure at the same time..Read more. Although I feel the Yamaha Rhino is an excellent looking and performing machine from the factory, I feel there is certain items that can be changed to make it look and perform even better. One of those items is the front bumper, The bumper is the first thing others will see when they see you coming and it is the item that will take the most abuse if you make new trails..Read more. I bought my 08 Rhino in July of 2008, it is a Special Edition model with the basic pre-load adjustable shocks. A little over a year and nearly 1400 miles later I set out looking for an affordable set of aftermarket shocks that will fulfill my needs on the trails. My bike is a trail machine not a race machine, I will not be running wide open for hours at a time jumping whoops and racing professionally but I will be riding 25-35 mph over some pretty rough terrain at times and playing in a little mud here and there, Read more. Have you ever noticed how the stock seats rock from side to side? I have and have always thought the aftermarket seat bases were an excellent idea but until I installed my new Super TSX seats I keep putting them on the "to do later list". After installing my new Beard seats I noticed my seat bases were incredibly weak and seemed to wobble around even more than stock..Read more. I have spent a lot of time researching my options for a set of seats for my rhino and with it being such a big investment it was not something I wanted to do nor could I afford to do more than once. After doing a lot of research and finding Beards new Super-TSX seats being a true suspension seat and the chosen seat of many of today’s top UTV racers. Read more. I feel a good set of harness's is a must, it doesn't matter if you are an aggressive trail rider looking for a challenge or if you are a trail rider just out to spend time with the family, Safety should always be the first thing on your mind. If you ride offroad this may be the most important investment you can make. Read more. Seizmik Rhino Modular Door System. If you ride fast and hard then these doors are for you, they not only look good but they also help protect the driver and passenger. The quality of these doors is top of the line, constructed from strong 6061 T6 aircraft-grade aluminum and super light, weighing in at only 5.5lbs per door and 2.5lbs for each Mounting plate for a total of only 16lbs. Read more. KFI 4000lbs wide spool winch. First off I would like to ask do you ever get in the mud? Do you ever climb hills? or Do you ever ride alone? If you answered yes to either of these questions then my suggestion to you is to invest in a good quality winch, because when your 20 miles from no where and knee deep in mud you will wish you had took my advise. Read more. Here in the hills of Tennessee, on occasion I find myself having to make a new trail, sometimes to get around an obstacle in the main trail and sometimes building a new trail altogether. When doing this the radiator could and will take some serious abuse if it is not protected. Knowing this I went to Extreme Metal Products looking for a radiator guard. Read more. This project just made the February 2012 Rig Profile at the Gear center group!. Here's the link. Me and the Rhino Just made GBC's August Fan of the Month. Check it out or enter to win next month at the following link. This Project made UTVWeekly.com May 20, 2010 here's the link..
Another Video just hit UTVWeekly.com January 1, 2011..